Lower profile snapback cap. Adjustable plastic fastener, eyelets, tonal under-peak lining, seam free front panel. Mid-weight. 100% cotton. One size fits all. Arena Two Tone Cap. 100% Cotton. 6 panel structured laid back front, pre-curved peak. Contrast peak and crown with piping. Short crossover velcro closure. Colours: Black/White/Gold, Black/White/Green, Black/White/Grey, Black/White/Magenta, Black/White/Orange, Black/White/Purple, Black/White/Red, Black/White/Royal, Navy/White/Gold, Navy/White/Red. Sizes: One size. fits most. Heavy Brushed Cotton With Suede Peak. 100% Cotton. Six panels structured laid back front. Pre-curved peak. Short crossover velcro closure. Suede peak and crown-top. Colours: Blk/blk, Blk/bottle, Blk/gold, Blk/Grey, Blk/red, Blk/tan, Bottle/tan, Maroon/blk, Natural/blk, Natural/bottle, Natural/navy, Natural/red, Natural/tan, Navy/bottle, Navy/gold, Navy/. Grey, Navy/navy, Navy/red, Navy/tan, Red/tan, Royal/tan, White/navy. Sizes: One size. fits most. 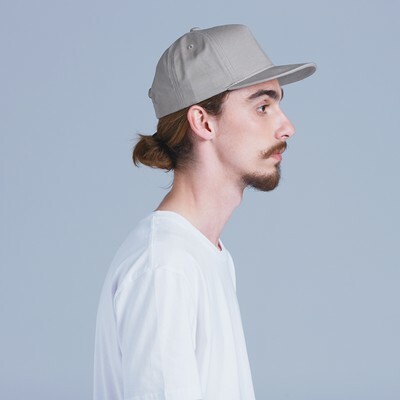 Cotton Twill Structured Cap. 100% Cotton. Six panels structured laid back front. Pre-curved peak. Short crossover velcro closure. Colours: Black, Maroon, Red, Navy, Royal, White. Sizes: One size. fits most. Kids Poly Cotton Legionnaire Hat. 65% Polyester, 35% Cotton. 5 panel square front. Hole at back with velcro. Colours: Black, Bottle, Gold, Maroon, Navy, Red, Royal, Skyblue, White. Sizes: Children sizes only. Slouch Hat With Break-Away Clip On Chin Strap. 65% Polyester, 35% Cotton. UPF rating 50+ Excellent Protection. Meets AS/NZS 4399:1999. Poly/Cotton fabric with hard brim. Self colour metal eyelet for ventilation. Toggle and break-away clip on chin strap. Colours: Black, Bottle, Gold, Maroon, Navy, Red, Royal, SkyBlue, White. Sizes: 55cm (S). 57cm (M). 59cm (L). 61cm (XL). Chin Strap With Break-Away Clip. Toggle and break-away clip on chin strap for use on hats without strap. Colours: Black, Bottle, Gold, Maroon, Navy, Red, Royal, SkyBlue, White. Sizes: One size. fits most. Polyester Rip Stop Foldable Cap. 100% Polyester Unstructured cap with foldable peak, adjustable back strap for all sizes. 100% Polyester Rip Stop fabric with CoolDry Mesh back lining and sweatband. Ultra light mesh in contrast contoured side panels for ventilation. Colours: Black/gold, Black/red, Black/royal, Black/white, Navy/gold, Navy/sky, Navy/white, White/lighblue, White/navy. Sizes: One size. fits most. 100% CoolDry Pique Mesh Cap. 100% Polyester. Structure laid back front. Pre-curved peak. Contrast colour contour panel from edge of front peak cross side of cap to back of cap. Velcro strap closure on back of cap. Embroidery decoration can be done on front crown, sides and back of cap. Colours: Black/gold, Black/red, Black/white, Em- erald/with, Navy/gold, Navy/red, Navy/. sky, Navy/white, Maroon/white, Red/white, Royal/white, White/navy. Sizes: One size. fits most. Premium Cotton Twill Contrast Trim Cap. 100% Cotton. Six Panels structure laid back front. Pre-curved peak. Contrast colour sandwich, eyelets, and stitching. Short crossover velcro closure. Colours: Black/white, Navy/white, Red/white, Royal/white. Sizes: One size. fits most. Peak and Eyelets Contrast Cap. 100% Cotton. Six panel structured laid back front. Heavy Brushed Cotton with Contrast trim on peak. Short crossover velcro closure. Colours: Black/red, Black/white, Navy/white. Sizes: One size. fits most. Premium Cotton Twill Contrast Trim Cap. 100% Cotton. Six panels structured laid back front. Contrast piping across peak & crown. Short crossover velcro closure. Colours: Black/gold, black/red, black/white, navy/gold, navy/red, navy/white, white/navy. Sizes: One size. fits most. Tri-Colour Pique Mesh Cap. 100% Polyester. Six panels structured laid back front. Breathable pique mesh with UPF rating 50+. Contrast piping on crown. Short crossover velcro closure. Colours: Black/white/red, Navy/white/red, White/navy/red. Sizes: One size. fits most. Tri-Colour Heavy Brushed Cotton Contrast Cap. 100% Cotton. Six panels structured laid back front. With contrast colour triangle shape on peak & back of crown. Gun metal buckle & tuck in return. Colours: Black/white/Grey, Black/white/red, Navy/white/sky, Navy/white/red. Sizes: One size. fits most.